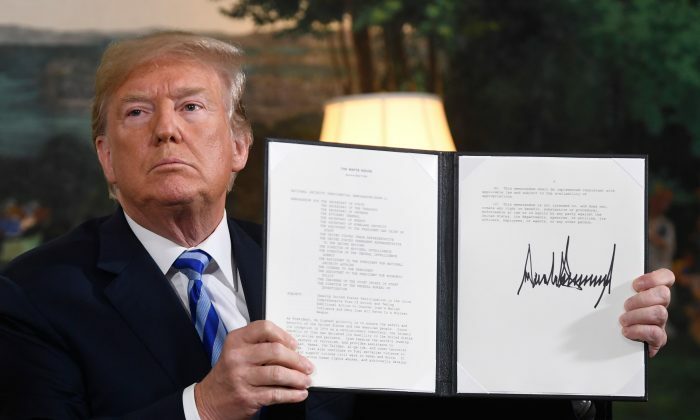 President Donald Trump announced he’s withdrawing the United States from the Iran nuclear deal and signed an Executive Order to reimpose tight sanctions on Iran previously lifted as a part of the deal. The deal was negotiated by the Obama administration and enshrined cessation of many sanctions against Iran in exchange for its postponing its nuclear program for 10-15 years and giving up most of its enriched uranium. Iran has insisted its nuclear program was not for weapons, but on April 30, Israeli Prime Minister Benjamin Netanyahu presented what he said were Iranian documents, obtained in a daring Israeli intelligence operation, that prove Iran had been developing nuclear weapons before the 2015 deal it signed with the United States, China, France, Russia, United Kingdom, Germany, and the European Union. Trump has severely criticized the deal, since long before his presidential campaign. “It didn’t bring calm, it didn’t bring peace, and it never ever will,” he said. The Iran deal was promoted by then President Barack Obama as “the best option”—the only way, even temporarily, to keep Iran from wielding nuclear arms. Beyond that, Obama painted a picture of an Iran “rejoining the community of nations” upon being granted sanctions relief. Yet Iran has been reported to have gone in the opposite direction. Last year, Iran’s Islamic regime announced a 150 percent increase in its military budget—developing long-range missiles, armed drones, and cyber-war capabilities—while putting to use some of the up to $150 billion in assets abroad that had previously been frozen due to sanctions. The United States lists Iran as a state sponsor of terrorism and has long criticized it for funding terror groups like Hamas, Hezbollah, and the Houthis, “whose chants of ‘death to Israel’ are now also accompanied by vows of ‘death to America,’” wrote Arab–Israeli conflict analyst Alan Dershowitz in an October op-ed. The Iran deal was put in place without Congress approval and the legislators passed a law that forces the President to evaluate its necessity and renew it every three months. Trump has warned that he’d scrap the deal if it can’t be renegotiated to include the ceasing of Iran’s ballistic missile program and other demand. On Tuesday, he did just that. “The United States no longer makes empty threats,” he said. Iran has warned it could quickly start enriching uranium again if the deal ends, but Trump vowed to prevent Iran from achieving a nuclear weapon. Achieving such a weapon would “only endanger the survival of the Iranian regime” itself, Trump said. He predicted Iran will respond to his withdrawal from the deal by a loud refusal to negotiate a new one, but also said the regime will want to make a deal eventually. “When they do, I am ready, willing, and able,” he said. The Trump administration stated in a Tuesday release that the re-imposed sanctions will target critical sectors of Iran’s economy, such as energy, petrochemical, and financial sectors. Since its planning stages, the Iran deal faced bipartisan criticism—that it requires too little from Iran in exchange for too much from the international community. “Even for those who support the [Iran deal] in principle, President Obama and Secretary of State John Kerry’s … serial concessions and excuse-making for the sake of ‘preserving’ the deal have been troubling,” wrote Washington Post journalist Jennifer Rubin in a January 2017 op-ed shortly before Trump took over the presidency. While the deal was still being negotiated, the Obama administration derailed a law enforcement campaign against Hezbollah’s massive international drug trafficking operation, “even as it was funneling cocaine into the United States,” according to a lengthy Politico investigative report. 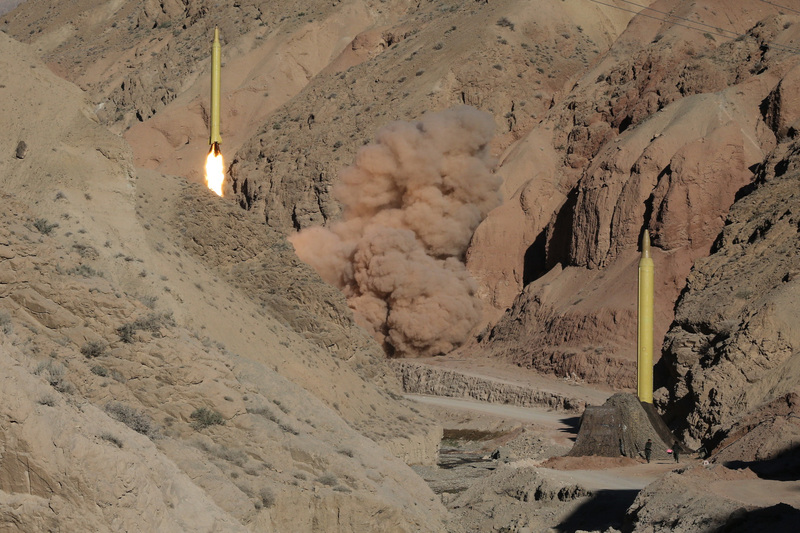 When Iran followed the deal with a slew of missile tests, the Obama administration stated the tests didn’t violate the deal. Instead, it placed sanctions on 11 individuals and entities connected to the missile program. Iran still runs a plant that produces heavy water, a critical component in the production of nuclear weapons-grade plutonium. While the deal only allows Iran to keep a small batch of enriched uranium, it does permit the country to keep 130 tons of heavy water—plenty to make a heavy water reactor for turning natural non-enriched uranium into plutonium. As part of the deal, Iran traded with Russia some 9 tons of its enriched uranium for 154 tons of non-enriched uranium. Just before Obama left office, Iran was to receive another 130 tons of non-enriched uranium from Russia in exchange for 44 tons of heavy water that, if kept, would have made Iran in breach of the deal. The move was “approved by the outgoing U.S. administration and other governments seeking to keep Tehran committed to [the nuclear deal],” The Associated Press learned, referring to two diplomats requesting anonymity. 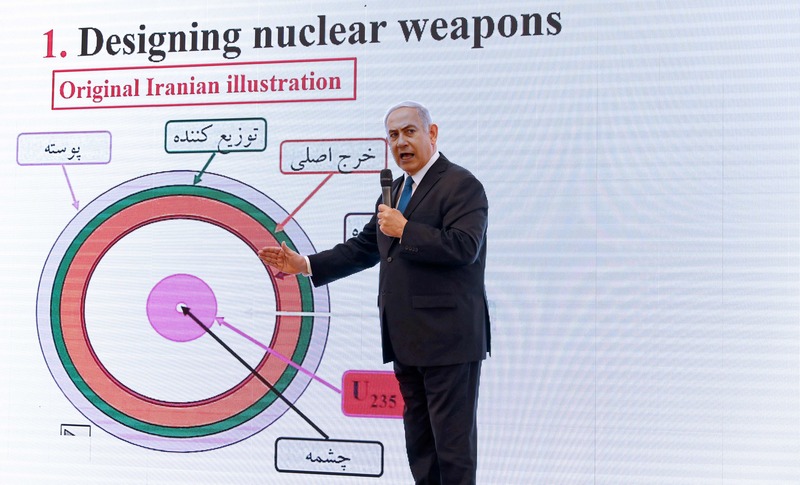 But the documents revealed by Netanyahu give ammunition to critics of the deal, who argue that given Iran lied to cover up its nuclear program that existed long before the deal, it can still find ways to lie about it now. Ivan Pentchoukov and Reuters contributed to this report.